Rinoi held the meeting atop a rock-outcropping above the Gorgrond wilds. Several events occurred the past week. Charlie returned from Stormwind where he was exorcised from a demon that inhabited him. Fortunate for us, before the thing murdered anyone we knew. James also returned from Azeroth, where he had a powerful sword reforged. Harold mentioned en passant that he and other Braves chased after a small contingent of orcs that stole some Brave supplies. After retrieving them, they blew up their camp in spectacular fashion. With the meeting were two Highmaul ogres the Band had met on the road through Gorgrond. They were transporting a mysterious chest to a Horde outpost- but the Band attempted to diplomatically convince them to give whatever artifact they had to them instead. When Shapur finally managed to convince them to do so, one of the ogres turned out to be a giant plantmonster that sought to destroy everyone. Fortunately he was eradicated, but not before the other ogre was killed, and several Braves tumbled down the mountain. It did leave us with an ogre artifact however- something that must surely be examined in the coming weeks, and may lead to great treasure! Dimgo was voted in as a Braveheart. Rinoi held the meeting atop a windy, icecold rock above a canyon in Frostfire Ridge. Several new faces had shown up, so the meeting started with a small introduction to everyone around the fire. Afterwards, Rinoi opened the Tome of the Braves and read the names of several Braves that had not been around for quite a while. Several of them were scrapped from the records due to the inactivity. For the coming week, the seal we got from the Highmaul ogres will be examined for information- so we may better plan our next move. Furthermore; Harold has moved forward with a plan to assault an Iron Juggernaut. First on the agenda; acquire a gyrocopter from the goblins, as an escape vehicle. Other aspects of the plan were also discussed, but no consensus was reached yet. Lastly; the Battle of the Braves is slated to be fought this week! No-one was promoted as Braveheart, but new and old faces did join our fire. 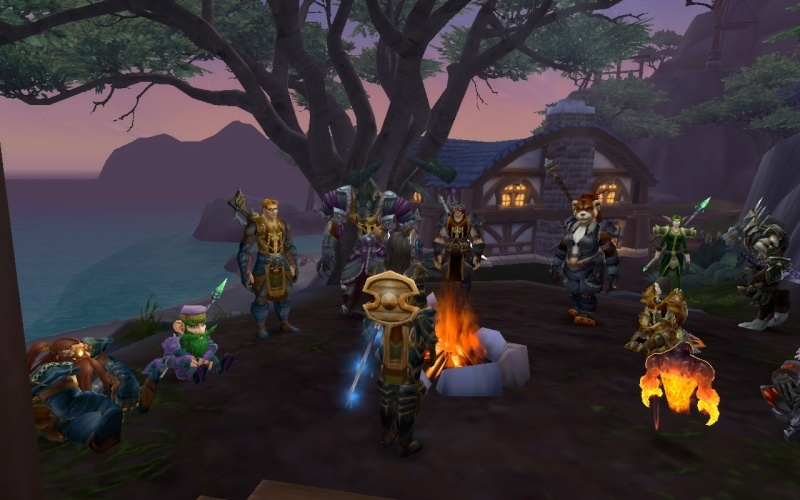 Rinoi held the meeting by a gazebo atop a cliff, in the bustling Alliance town of Stormshield. The meeting started with once more congratulating Tygos on winning the Battle of the Braves the week prior. Lennix stepped forward and announced the next battle to take place next month, on February the 25th! Giving everyone ample time to prepare to attempt to bump Tygos from his throne. Furthermore, last week the ogre tablet we had acquired was examined further. Through some curious experimental probes, we discovered the tablet was both a portal and a key. The portal leads straight to a mysterious vault in the capital of Highmaul. The portal is actived by acting ‘ogre’ around it. The Band managed to do this by having a brawl. The portal also swallowed the rogueish Lomonde, as he leapt in to… scout ahead. The coming week, we will travel to Nagrand and plan our next move in this heist! Lastly, the previous week saw Harold and some Braves return to the goblins once more to secure some choppers. Many goblins may have died, so our chances of diplomatic solutions with the little greenskins is getting more slim by each passing week. We did get some choppers though, which may come in useful for a dashing assault on an Iron Horde port! No-one was promoted as Braveheart, but once more some old faces joined our fire! 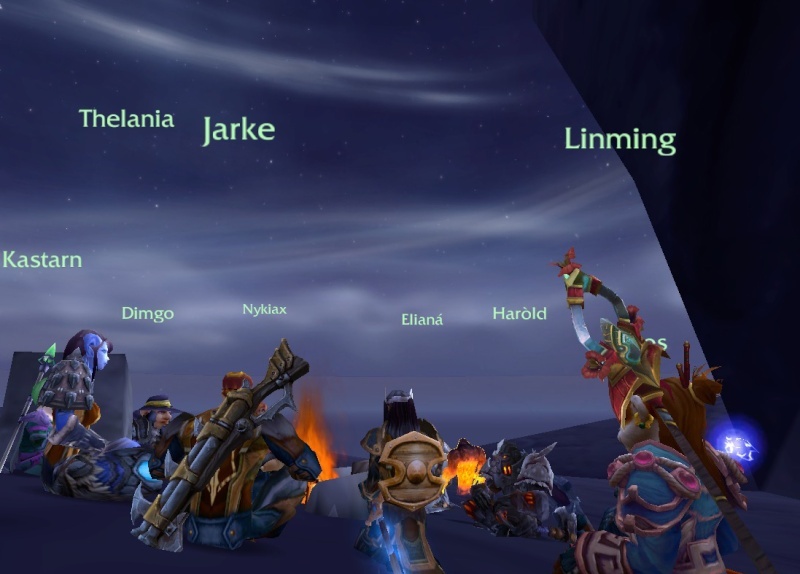 The band had gathered at this spot in preparation for the final assault on the vault of Highmaul. The campaign they had been working on for the past month! Last week they had, in typically loud Brave fashion, scouted out the outer walls, and the inner city. It was not without troubles of course. Rockslides, ogre intrusions, frozen orcs with flamethrowers and freeing the dancing slave Lomonde had become were all part of what awaited us! That was not all that happened last week though. To repair the Band’s reputations with the goblins somewhat, we agreed to smuggle an Ogron from Talador, through the Spires of Arak, up to Pinchwhistle Gearworks. A road guarded by Shattered Hand Orcs. Fortunately it went surprisingly well, considering Ogrons aren’t the stealthiest creatures! Secondly, a curious tale worth examining courtesy of Lennix! A one-armed draenei claiming there are Botani growing in the temple of Karabor? What could that be all about?! Nykiax, Lunanoh and Eliana were voted in as Bravehearts! 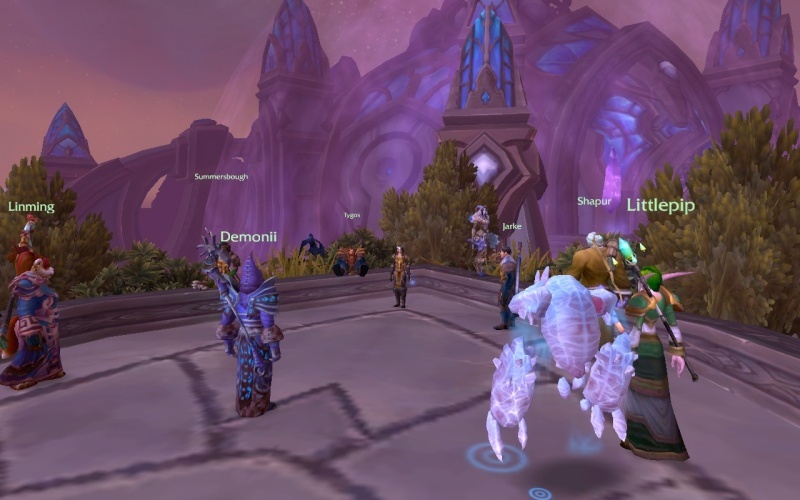 The meeting started in a rather confused manner, as Chief Rinoi had been concussed following the raid of Highmaul and had been slowly recovering. The group tried to piece together the events of the looting of the vault. A few of the Braves present were in fact taken over by a botanic entity, that infiltrated the Band. All these strange plant entities revealed themselves when the group entered the vault in Highmaul. Suddenly turning against the -real- braves! Fortunately they were defeated, and the Vaults treasures were acquired. Those that had been taken over were unaware of any of these events though, having experienced weeks of sleep. There was a lot of catching up to do. With little headway made in the understanding of the events, Lennix reminded everyone that the Battle of the Braves would take place next week! As the meeting was winding down- a strange sight appeared on the horizon. Trolls and Orcs, breaking unto the land on their canoes, and storming the beach! A fight ensued, as the Band sought to protect the campsite from these marauders! Fortunately we won, but the night was an uneasy one, knowing the angry Horde lurked in the shadows! Lelitha was voted in as Braveheart! 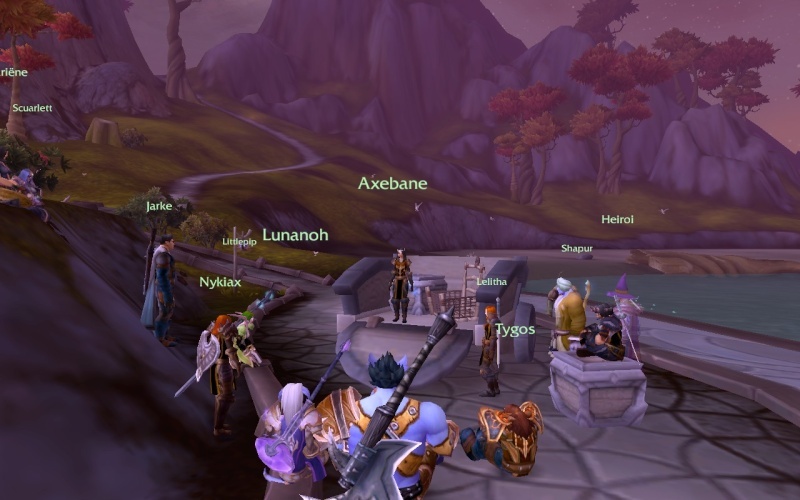 Rinoi held the meeting in the Alliance garrison in Shadowmoon, atop a waterfall. It was a calm meeting, due to everyone recovering from a hangover. The night before, Rinoi had ordered everyone to get drunk and party. Thusly the meeting was led by a rather croaky voiced Chief. Last week the meeting was interrupted by a small raiding party of orcs and trolls. Good thing the Band had managed to fend them off! Fortunately, the current meeting was in less danger of being so interrupted. But this tranquility will not last forever; Adventure is our call and we must head back out into the hostile world! 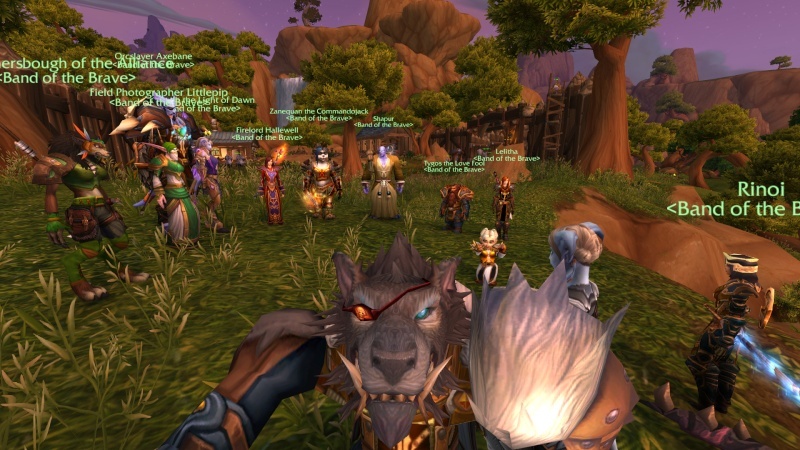 The Band had returned to Shadowmoon after taking a wrong path on the road to Arak. In an attempt to find another way through the mountains- they stepped too close to an outpost of Shadowmoon Orcs. They fought back against the invaders, and then hastily retreated back to Embaari Village to recover. The Spires of Arak will have to be scaled another time! First up though; the Battle of the Braves is due again this week! Another exciting battle to determine who becomes our Champion for another month! After that- we head back out into the world. Littlepip knew of one opportunity she had heard of; Bathing in the hot springs of Gorgrond. A dangerous endeavour to bathe in such hostile lands; but provided we keep a strong lookout- we could enjoy ourselves a little! Littlepip was voted in as Braveheart! Rinoi held the meeting by a fisherman’s house along the south-western coast of Talador. The meeting was opened as the Band looked back at last week. Kastarn, our resident gnome mage had won the title of Champion of the Braves for the last month. Otherwise, we had a rather relaxing week. Snoozing about in Shadowmoon Valley, and the one expedition we had took place in Gorgrond, where the Band indulged in some hot spring bathing. Fortunately, no Iron Horde interrupted this bathing- although a dragon did appear. There was some confusion as to the nature of dragons and their place in Draenor, but it was decided that whatever it was, it having been scared off was a good thing! The meeting then moved on towards the coming time, and events on the horizon. The lazy days were soon to pass, as Rinoi spoke of prisoners and among them, old friends, being hung from the gates of The Blackrock Citadel in Gorgrond. Regardless of how small their part in the war effort would be, she declared that she and the Braves would not stand idle as the broken bodies of friends and comrades were made a mockery of, and put on display. News had also reached the Chief that Doctor McCartney, another former companion of the Braves had struck out on his own with the help of the Ogron Murg, attacking and raiding orc encampments and slaughtering indiscriminately; unarmed families, including children, were not spared. The Band was divided on whether this was a good or a bad thing- but Rinoi stifled the discussion saying it would be looked in to. Lunanoh spoke of the opportunity of raiding an Azerothian Horde’s caravan, to steal some of their supplies and stolen artifacts of her people. The plan was soon to be set in motion; tomorrow would be their chance. Shapur pointed out that the Draenic Day of Immortality had come and passed. It was an important astrological event. Shame we missed it. Voranos(Axebane) was voted in as Braveheart! 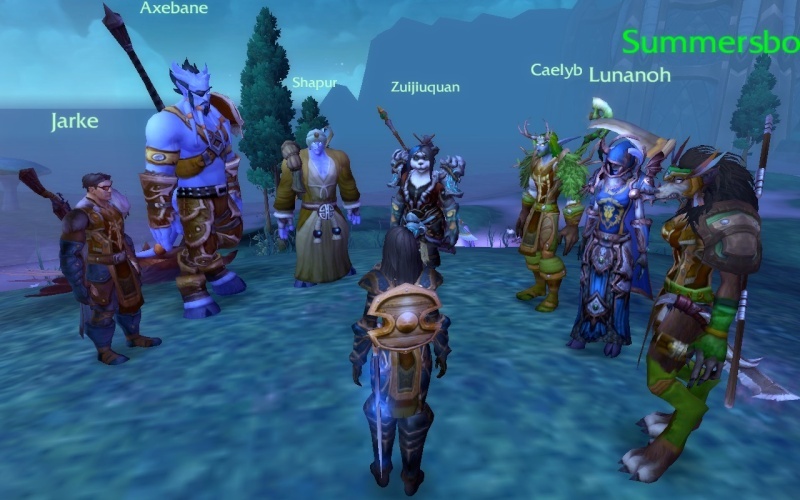 Rinoi held the meeting in Gorgrond atop a ruin near Wildwood Wash.
Two strikes had been made against the Horde this past week, one against the Azerothian one when Lunanoh planned out a heist against a caravan that would pass by. Although the original plan was to get as little bloodshed as possible- it did turn out so. At first due to an overhasty attack by the Braves, and lastly, when the firing stopped, the orcs refused to surrender and yield their supplies. Instead they fought to the death. The second strike was made against the Iron Horde- although it hurt the Braves far more. A small expedition headed to the Iron Docks where the Blackrock Orcs were rumored to be putting their prisoners on display as a joke. When the group arrived, they found the wall scarcely guarded, but filled with the corpses of hung enemies of the Blackrock. Only three survivors were found in the time the Braves could spend there. One of them was Dr. Ariane Harding, who joined the Braved to repay them for her rescue. The Band also found some Blackrock Engineers, hung by their own kind amidst the wall. One of them carried a mapcase with blueprints, that the Band took. Before reinforcements arrived, Littlepip set ablaze a set of firerunes she had crafted- burning every corpse along the wall, so they would be hung to shame no more. The blueprints turned out to be the plans for some kind of massive siege-weapon. Several Band-members worked together to decipher the orcish engineering text. Although not conclusive by far, a next move has been planned; to assault the factories near Frostfire Ridge. To learn more of this weapon, and to see if it could be sabotaged before being put into production. Other possibilities for future adventures were also discussed. Littlepip spoke of a rune she had been hoping to study, located in Arak, in the Bloodmane Valley. Meditating near the rune would be tough in such a dangerous area, so she would need the Braves to watch her back. Lastly, no Bravehearts were promoted this meeting. 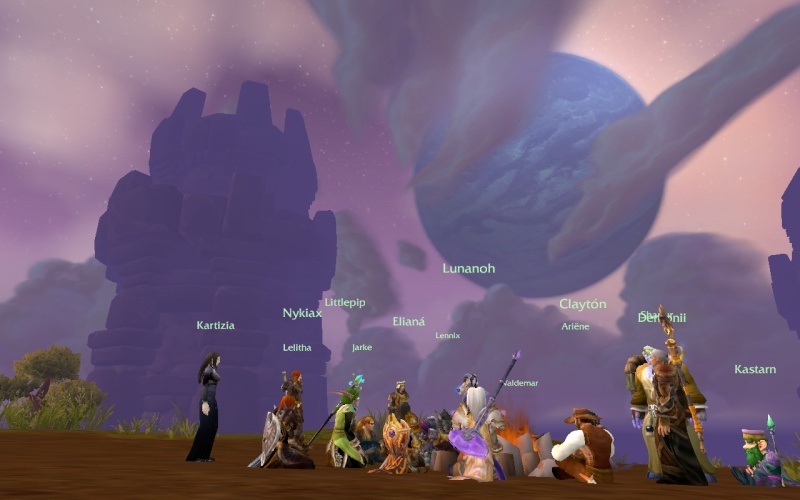 The thirty-third Official Brave Meet 16/03 - 2015 wrote: James held the meeting in Nagrand atop a mountain south-west of Telaari Station. Last tuesday we were going to help Littlepip obtain the Rune of Blood, that she said would temporarily empower us when activated. However, no Pip was found, and we Braves decided to get it by ourselves. And we did. Unfortunately we did not understand its danger, and we soon turned against each other in a bloody, mind-controlled free-for-all. We managed to destroy the rune and escape with our lives. We once again struck a blow against the Iron Horde last saturday, this time in Frostfire Ridge, where we stole plans for a possible prototype for the Iron Star cannon. We also encountered an engineer that we captured. He will be interrogated soon, and we will know more about this possible Iron Slingshot we see so much about. We might bring this massive siege-weapon down with all the knowledge we'll obtain from these plans. Alekszander continued his plan of robbing the grave of a Draenei turned Eredar. Many were against this, and saw it as disrespectful, along with myself. This all will happen tomorrow, so we may see what it will bring. If this will actually happen, considering how many were against it, I'm not sure. Shapur spoke with us of a letter that came from Dr. McCartney, who we heard had massacred many innocent orcs - men, women and children alike, wanted to meet up with Rinoi. We think he has something up his sleeve, and those that want to join us in this may do so on wednesday this week. Shapur also told us that many human offsprings were born this week. Very healthy. To battle the huge mortality rate, he said. Lastly, Mei-Lin and Harold were voted in as Bravehearts. Thelania was voted in preliminarily. 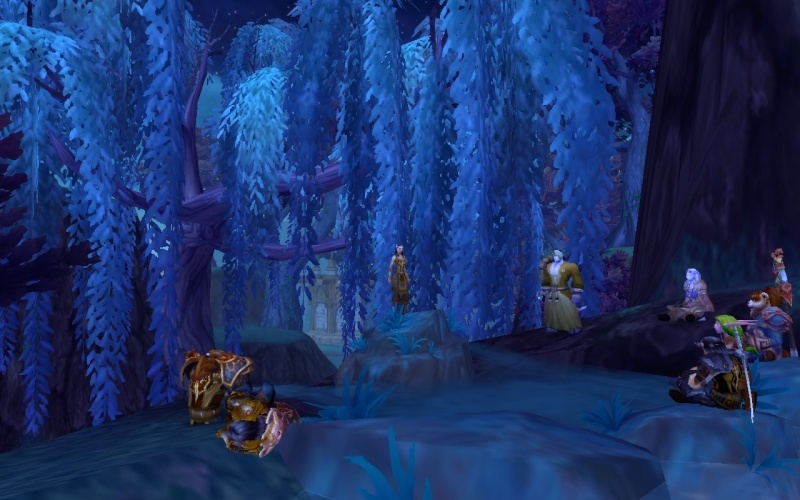 Rinoi held the meeting in Nagrand, on the northern cliffside of Telaari Station. The meeting was held in antsy haste, as the threat and presence of a group of Horde forces; The Painted Skulls, Bloodwolf Clan and others were ready to set up a mine in the nearby Stonecrag Gorge. Not only to gather resources for themselves, but endangering ancient artifacts of unknown power. The Band would move in to make sure this did not happen. Weapons were sharpened and plans were made. This battle was sure to not be easy, and take multiple days. Briefly, the group recapped the previous week. Doctor McCartney, an old companion of the Braves, had been confronted by the Band after he had been known to fight the Iron Horde in unorthodox ways; killing women and children en masse. He had also subdued and enslaved the Ogron Murg. When the Band approached him, a fight broke out- and the Iron Horde stormed in to fight McCartney’s troops as well as the Band. In the fighting, Murg was killed, to the dismay of many Braves. McCartney got away. 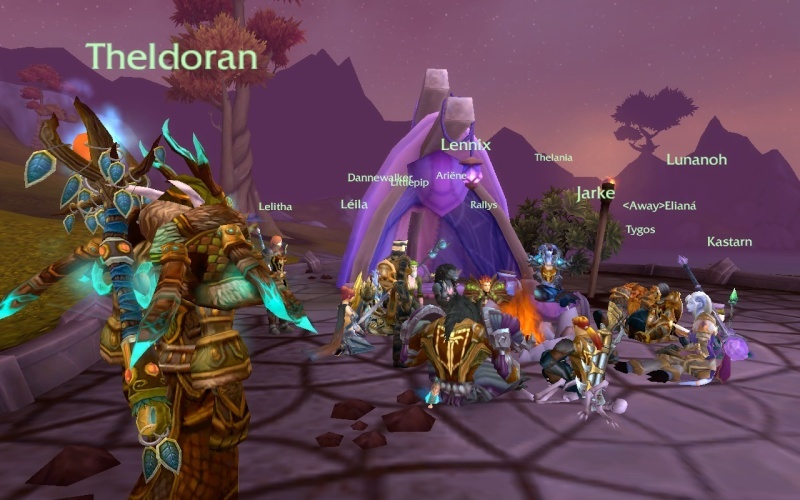 The rest of the meeting was rushed and unfortunately forgotten, due to reports that the Horde was indeed on the move. There was enough time to do a preliminary vote for Bravehearts. Summersbough got many votes, but the official promotion was delayed till after the day’s fighting. Later on, after the meeting, Summersbough was voted in as Braveheart. Rinoi held the meeting on one of the garden terraces of Auchindoun. 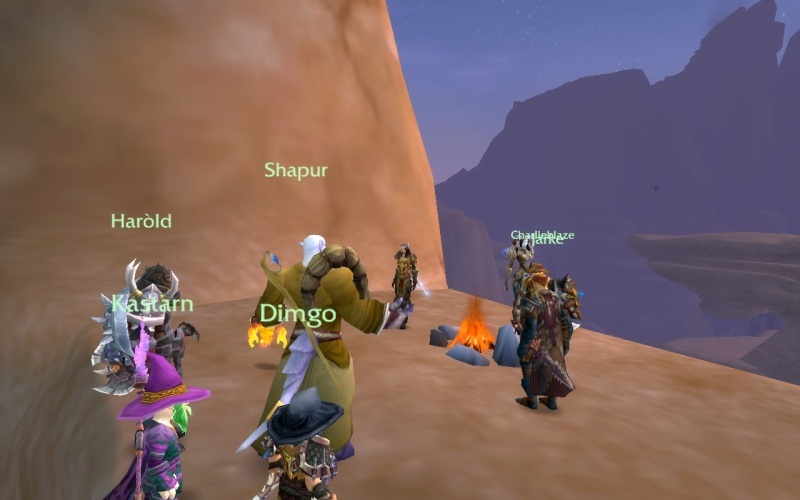 It started with recapping the week-long battle that raged in Stonecrag Gorge in Nagrand last week. It was a tough time for the Braves, and nearly every battle was lost. We were unable to set foot in the gorge to find the artifact that was rumored to be down there. Instead, the Painted Skull trolls and their Horde allies beat us back at every turn, even taking prisoners that were tortured as we tried to fight for control. Fortunately, we managed to capture some of theirs as well, and after some difficult negotiations requiring several translators and many threats, a deal was struck. The Horde would get a day to mine what resources they wished from the gorge, promising not to lay their hands on the artifact. Afterwards, both parties agreed to leave the place well alone. The deal was sealed after a day, after which the prisoners were exchanged. Afterwards, the Band and the Horde even agreed to some light sparring and sharing food and talk by the campfire. It was not all sunshine and roses though. 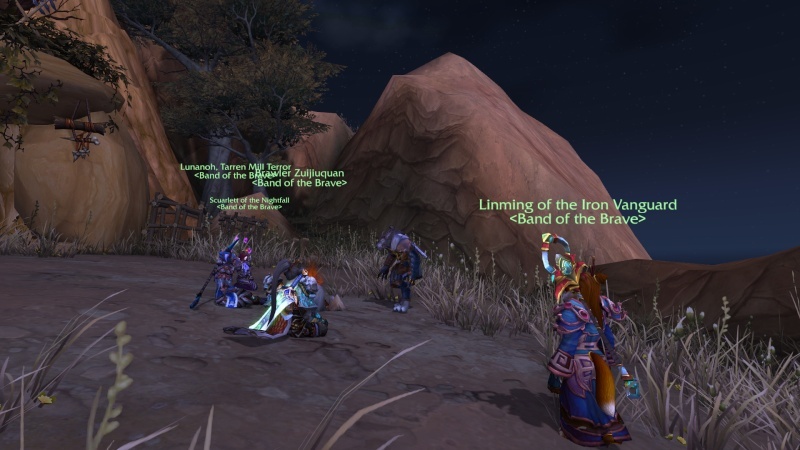 Lin’ming raised the point that when the Band witnessed members of the Azerothian Horde being attacked by the Iron Horde of Draenor, few Braves lifted their fingers to help. However, this is is fair. We should not, and are not required to. Despite not wishing constant conflict, we’re not a charity either to help our long-term foes in their struggles. With the Nagrand campaign over, the Band can return to other intrigues of the continent. Littlepip has located a new rune, atop a frozen, windy hill in Frostfire Ridge. An exciting prospect, as we can get some mountaineering in too, and perhaps get to name a peak! James suggested the Band would go hunting soon, and stock up on some fine fresh meat and provisions. Sampling the savage meat that the continent is rich with. But first up; The Battle of the Braves is this week. The previous champion Kastarn has gone missing, so the title is entirely up for grabs again! A new champion to lead us against the well-armed, and dangerous Horde would do well for our future chances, should these skirmishes happen again. After the meeting concluded, and Lord Daerion Mallister sat everyone down to tell one of his classic tales; of Sir Lanceafew and his quest to find the ‘Manual of Ladies’. No Bravehearts were voted into the Band. 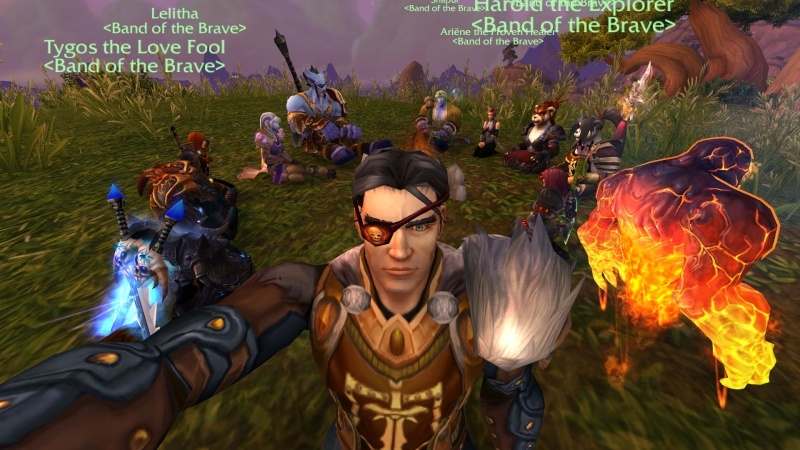 Rinoi held the meeting on a hill north of Karabor, by Tygos’ grave. The meeting was brief. Rinoi spoke about the recent events that led to the death of Braveheart Tygos Thunderfist. In recent weeks, the dwarf was plagued by frustration, anger and hatred. Setting him at odds with others in the Band. Yet last week, when he taunted one of his fellow Braves; Eliana, she was provoked too far and brought her sword down onto his neck. Lunanoh, in shock and retaliation, took Jarke’s rifle and shot Eliana. Leaving a Brave dead, and another gravely wounded. This is not what the Band of the Brave stands for. If Braves can not find it within themselves to be at peace with their comrades and to look past each other’s differences, they are not fit to be part of the Band. We must be willing to help and stand by our fellow Braves, and to be open to accept help when it is offered. Whatever troubles beset us. When you are part of the Band, you are part of its family. If members cannot look past their frustrations with other members, they must speak out about it. If issues still cannot be resolved this way, someone will have to walk away. Harmony cannot always exist, but it should be strived for. The meeting was ended when a Horde warband waltzed over the group, scattering everyone with these thoughts imposed on them. The fourtieth Official Brave Meet 27/04 - 2015 wrote: Many apologies for not making more posts about our earlier meetings, I've been busy. Let's get on with this! 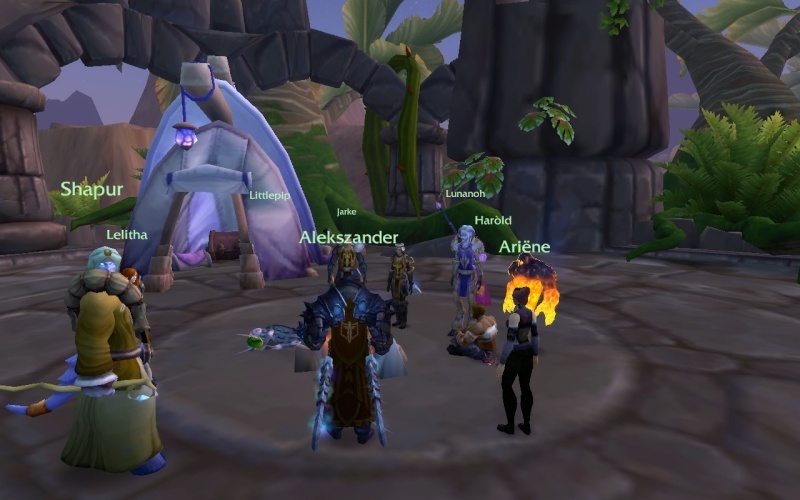 James held this meeting on a spire in Spires of Arak, south of Skyreach. Not many came to the meeting, and most didn't have much to speak about. Skarain's group wasn't there either, herself included. I spoke about what we were doing this week. I've been planning on doing a hunt with the Braves for a while, and we'll do it this wednesday. We'll have fun and enjoy ourselves while possiblyt learning some new things in the process. We're also having another Battle of the Brave to see if we can get a new Champion! Lelitha has sadly left us, and that title is up for grabs for whoever wins the battles. Lastly, Monrena was voted in as a Braveheart, showing her skill in combat and kindness out of it.